We expose ourselves to the sun every day, which can cause damage to our skin without us even knowing. We need to protect ourselves from sun damage, because it can wear our skin down, cause wrinkling or sunburn and, in extreme cases, skin cancer. Does the Sun Have Benefits? You may have been taught as a child that you need sunlight for your body to make vitamin D, because vitamin D is not found naturally in most foods. Milk is fortified with vitamin D as well as other foods and drinks. And one can take oral vitamin D3 of 1,000 iu to 2,000 iu daily as adequate levels of vitamin D are important for health. Thus, sun exposure is not as important for the body's vitamin D supply as it used to be. Of course, being outdoors makes most people feel good. And playing tennis is better for your health than watching television. But you can still protect yourself from the sun's damaging effects while enjoying outdoor activities. The immediate danger of too much sun is sunburn. If you looked at sunburned skin under a strong microscope, you would see that the cells and blood vessels have been damaged. With repeated sun damage, the skin starts to look dry, wrinkled, discolored and leathery. Although the skin appears to be thicker, it actually has been weakened and, as a result, it will bruise more easily. However, the sun's most serious threat is that it is the major cause of skin cancer, which is now the most common of all cancers. 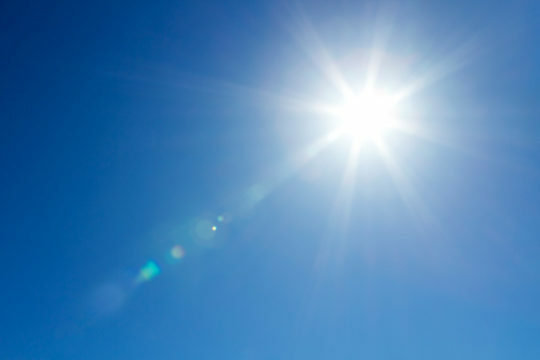 Doctors believe that most skin cancers can be avoided by preventing sun damage. Try to avoid sun in the middle of the day, from about 10 a.m. to 3 p.m., when the ultraviolet rays, which cause sunburn, are strongest. When you do go outdoors, especially for long periods in the middle of the day, wear protective clothing. Long sleeves and slacks, as well as a wide-brimmed hat, help protect your body against the sun's harmful effects. The easiest way to prevent the harmful effects of the sun is to wear the proper sunscreen. Wear sunscreen if you plan on being out in the sun for any length of time, not just when you spend time at the beach or park.